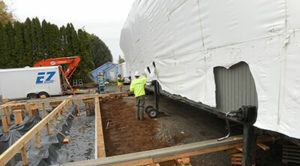 EZ Systems offers complete modular building set up and relocation services in Oregon and Washington. The most common uses for buildings are school classrooms, religious structures, social centers, and housing accommodations. Some buildings may be relocated several times over the course of their lifetime. Building sizes vary from single wide, one level structures to multiple width structures with two or more stories. Unlike onsite stick built buildings, modular structures are constructed inside temperature controlled environments on an assembly line. Starting with a steel frame, the unit will move along the assembly line as craftsmen and women add their individual components to the structure. When completed, the modular structure will be removed from the steel frame, and placed on a shipping frame for transportation to its destination. 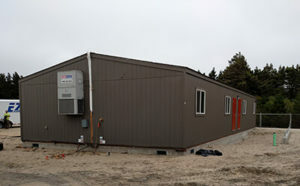 Custom modular buildings are very popular, offering a faster onsite project completion than traditional stick build structures. EZ Systems offers set services, where we receive the building from the delivering carrier, move it into the correct position, and permanently set it in place. Modular structures are permanently set on one of a variety of foundations, depending on the cost, location, local codes, and the needs of the end user. The set will include leveling the structures, making sure the floors are flush throughout, making all the final quick connections for electrical and HVAC, finishing the ceiling along the marriage line(s), closing up the interior and exterior mate lines, closing up the roof line(s) as necessary, and as needed, finishing the floor over the marriage lines. The interior buildout might include installation of interior walls, doors, cabinets, or other custom items the end user may have. We work with our client (usually a mobile / modular retailer) and their sub-contractors to help meet the project’s timeline for completion. 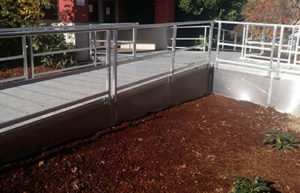 EZ Systems can also complete any additional exterior finish work, including porches, decks, ADA ramps, and other exterior finish work that may be required. Services include full restoration and remodels. 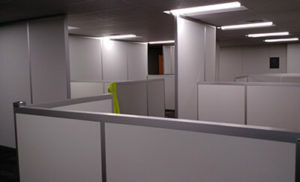 EZ Systems manufactures their own interior modular walls with core and finish options, which can be used to help meet the end user’s needs. Our walls are manufactured with sheetrock, luaun, or sound board exteriors and foam core interiors, and come in two finish colors, Cool White or Hampton Grey. The Cool White can be painted to the color choice of the end user. Our walls are manufactured in house, which allows us to maintain control of product quality. 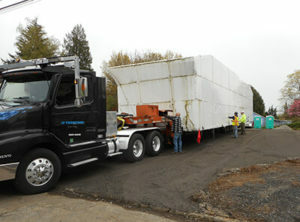 Our walls are manufactured just prior to being shipped out. All wall packages are unitized, shrink-wrapped, covered with visqueen, wrapped again in our own facility, then shipped out, usually on our own trucks, to limit handling and reduce the potential for damage. 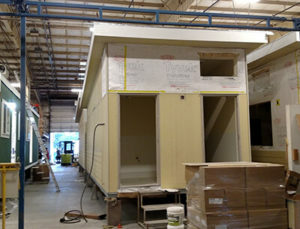 EZ Systems owner, Mike Richardson, and crew lead-man, Larry Pond, having both worked many years in all phases of production at Blazer Industries, a well-known quality modular builder, and are very well versed in modular construction and completion. We can offer to the point project options, competitive quotes and on-time project completions.